How can big data better help us understand the last grand frontiers of Earth? 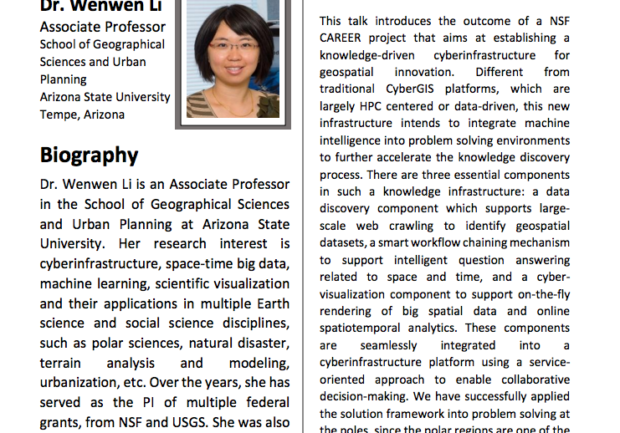 Associate Professor Ross Maciejewski hosts Wenwen Li, an associate professor in the ASU School of Geographical Sciences and Urban Planning, to talk about her research into the exciting field of cyberinfrastructure on Tuesday, September 12, 2017. 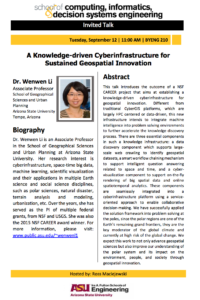 Wenwen Li introduces the outcome of a National Science Foundation CAREER project that aims at establishing a knowledge-driven cyberinfrastructure for geospatial information. Different from traditional CyberGIS platforms, which are largely HPC centered or data-driven, this new infrastructure intends to integrate machine intelligence into problem solving environments to further accelerate the knowledge discovery process. There are three essential components in such a knowledge infrastructure: a data discovery component that supports large-scale web crawling to identify geospatial datasets; a smart workflow chaining mechanism to support intelligent question answering related to space and time; and a cybervisualization component to support on-the-fly rendering of big spatial data and online spatiotemporal analytics. These components are seamlessly integrated into a cyberinfrastructure platform using a service-oriented approach to enable collaborative decision-making. Li has successfully applied the solution framework into problem solving at the poles. Since the polar regions are one of the Earth’s remaining grand frontiers, they are a key moderator of the global climate and currently at high risk of the global change. Li expects this work to not only advance geospatial sciences, but also improve our understanding of the polar system and its impact on the environment, people and society through geospatial innovation.